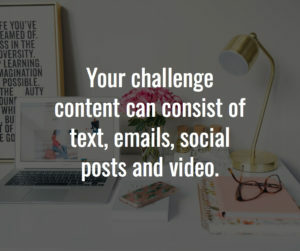 Online challenges are a great way to engage with your audience, and add readership to your blog … and people love them! Most challenges provide a solution over the course of the challenge to a problem – the very heart for having a blog. So, you are not doing a one-post solution, but a very in-depth one that can span anywhere from a week to a month. 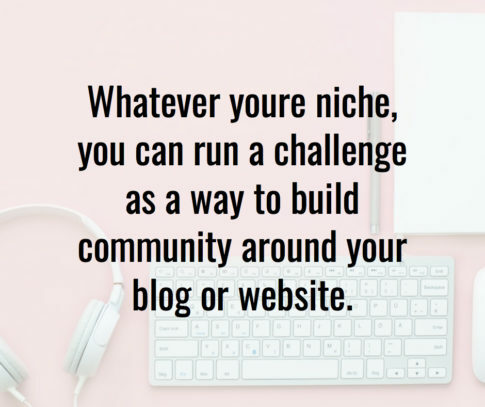 And most bloggers running a challenge are seeking a solution to the same problem they have, so it is comforting for your challenge audience to know you are going through the same things at the same time as they, so you are not only providing them a solution, but for you too. Basically, it becomes a personal testimonial from you and in the process creates the sense that you are an authority in that niche or at least have a solution to that problem as you have personally experienced it yourself. Running something that long and on a daily basis creates, as you could imagine, a flood of comments and questions – all fodder for you to further engage with those taking the challenge. In the process, you also find out a lot more about your audience. Next to personally replying to comments and questions, the next best way to increase engagement is to run a challenge on your blog. As odd as it may sound, you start at the end – the call-to-action -first and work backwards. You must have a clear goal in mind as far as what you want the participants in your challenge to do. Maybe your intent is to grow your email list; or it could be to buy a product or service you are promoting. The whole point of a challenge is by the end of it to have changed something. Keep in mind that it takes on average 21 days to instill a new habit, which could be the end result of the change – the “new normal” if you will. For example, if your challenge is weight loss, clean eating might be the new habit at the end. Along the way, you could promote a book or program on clean eating that your participants could buy to help them further understand how to implement a clean eating program into their life. Think of your challenge as a road trip – you have your starting point and ending point. Now all you have to do is map out the daily “route” participants will take to get to the end. The easiest way to do this is to create a mini-map for each day of the challenge. Some bloggers like to use the old fashion system of using index cards that can be sorted into any order. Others like to be more high-tech and use mind map software. Regardless of the way you do it, you will end up with the same result. When filling out your day-by-day plan, make sure each day builds on the previous days advice. Here is where the rubber meets the road on your challenge journey. On your blog, post each day’s topic. In your Facebook group, talk on a more personal level about specifics of the challenge you are experiencing as you go through it with them. Your successes and your failures. Soon, you will start to see comments from other participants about what they are experiencing. As you start to build comments, contact the poster and ask if you can use their comment on your blog as a testimonial. Testimonials further help build readership as potential participants thinking about joining your challenge can read about what people think of your blog and in this case, your challenge. This ends the series on Boosting Engagement for Bloggers. I hope you have enjoyed it and learn a few things on how you can make your blog better and boost engagement with your readership.